This is a 10"X8" Christmas card I made for Leonie Pujol, we met her for the first time a couple of months ago at one of her fund raiser events in Harlow, Essex she was as sweet and lovely as she appears on tv. I kept the card itself quite simple as I wanted my sketch to be the main focal point. In this photo though the hair shows up a lot darker than it is in reality. I used thick foam pads to make the image "pop" from the card and she's holding a "Dazzles" Gold peel off bauble that I stuck onto red mirror card and cut out. I hope she likes it !? A lot of Magazines out there now give away free papers with each issue, these cards were made using papers from "Creative Cards" Magazine Christmas papers. They're very time saving, the backing papers and elements are all matching you just need to add a blank card a few bits and bobs - et voila - you have an almost instant card. I love Nancy Watt's artwork, she is such a wonderfully talented lady and a lovely person to boot, her beautiful images make any card elegant with so little effort. These are from her "Winter Ladies" series which come printed on paper which I found a bit too flimsy for my liking so I adhered them onto very thin card before cutting and decoupaging them. The base of this card is from Papermania's "Vintage Christmas" pad, I just added "Dazzles" peel offs and a sentiment, Sakura Clear Sparkle pen highlighted the spray from her hat and parts of her dress. 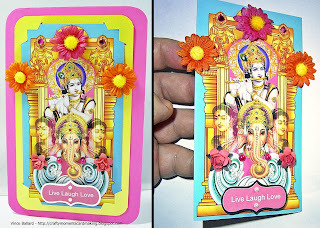 This card was made using patterned paper, Sakura pens and HOTP "Dazzles" peel offs. This card was made exactly as the one below except for being backed with gold mirror card. Here I used a frame of blue snowflake paper which I backed with silver mirror card and mounted it on the base card covered with a matching paper, then just added a peel off snowflake and sentiment. On this large card I used the whole image of the "Winter Lady" which I decoupaged and mounted on a blue snowflake design paper leaving a white border around the edge of the card. I then added thin silver peel offs around the edge of the image and added a large ready made sentiment at the bottom. If you haven't bought them yet, treat yourself to some amazing images which give a sophisticated elegant look to Christmas cards you'll probably want to keep for yourself. On the above card I extended the column simply by drawing vertical lines on a piece of card and covering with the rose stamps that come with the set. On the card below I cut off the column altogether and swiveled the image so it looks like she's laying down. Both were coloured using water colours. We recently received a packet of A4 Inkjet Magnetic sheets. At first I was a bit stumped with what to do with it - then my brain jumped into gear and I crafted like mad. I had a great time making fridge magnets and thinking of different ways I could use the magnetic sheet, now the fridge is almost full. If you've never tried this media you HAVE to give it a go! The soft magnetic sheet is bonded with a layer of high quality matt photo paper on one side that you can ink on, print on with your printer, stamp on etc. I found that stamping works particularly well and because it is soft and slightly cushioned it gave a perfect image. I was very pleasantly surprised at the quality that came out of our old HP printer. (my washed out, blurred photo's on this blog don't do it any justice) the images and colours were very crisp. The only down side to it is that you can't saturated it with water, although it IS meant to be used on a printer I did try water colours on it and it buckled slightly, Promo Markers and felt pens worked perfectly though. 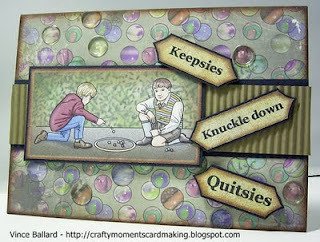 I used Brenda Pinnick's hardboard frames for a couple of the magnets leaving a boarder around the images to take the weight of the frame and toppers. I covered the frames with gems, sentiments and flowers which I attached using double sided tape and micro dots. although the sheets seem quite flexible and thin it can hold an amazing amount of toppers and embellishments and STILL cling tightly to the fridge metal. Cutting it into shape is simple you just use your usual scissors or a craft knife, it has the texture of a very soft leather or suede even cutting out those "fiddly" bits was so easy! You could print out your favourite recipes and have them to the fridge door where you can always find them. Print off emergency or important phone numbers. 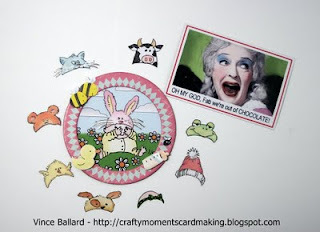 Print off a digital scrapbook page of your loved ones or memories. Print photos and attach to Christmas cards, that gran and gramps can put on display. 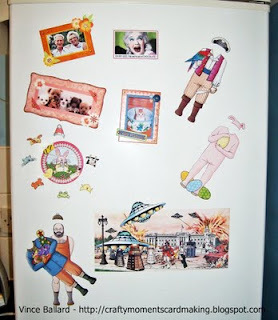 Scan in your favourite ATC's, print them off, put them on your fridge and let your visitors admire your artistic talent. Stamp your favourite stamps on paper, scan them into your computer, enlarge them, print them off - you could colour them either on your computer by hand and you have large A4 sized magnets, you could cover the whole door of your fridge!. Oooh I've slipped back into gear again, I'm off to make some more!